So my hair continues to grow, grow, grow! I did a wash n go a couple weeks ago and was pleasantly surprised at the results. Before then, I hadn't done a wash n go since back in May. I'm starting to get some hang time people! Normally, I would use my homemade moisturizing mist to moisturize it daily but I was watching a vid on Miss Jessie's and realized that re-wetting my hair will make it shrink up even more. 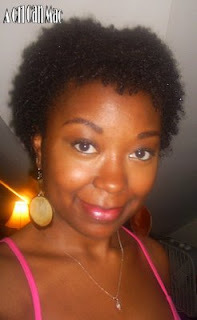 So I've started to moisturize my hair now with my latest AGCM Style Afro Detangler recipe. I like it. But I think I like this mix better for detangling. I want to get the Afro Veda Shea Amla Whipped Butter for daily moisture instead. It looks to have a whipped cream consistency and CoilsKinksCurls gave it an awesome review saying it smelled great and has her hair uber soft and moisturized. I tried the shea-amla and it left my hair a bit hard. However when I used it on top of loc hempseed, my hair was very soft. I prefer the loc hempseed butter and the cocolatte moisture mask. 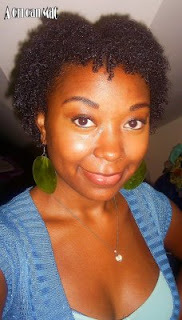 overall, most afroveda products are really good.. I'm slowly getting sucked into Afro Veda products. It started with the Pur whipped gelly. LOL. Thanks for sharing your thought! I saw this product too when I was checking out the website! Ur hair is on the grown girl! lovely! Your hair looks very pretty. I haven't done a wash and go for ages, the detangling would kill me! I love watching your journey though!